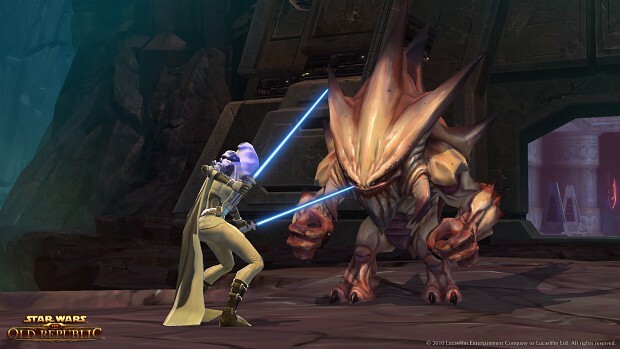 Star Wars: The Old Republic, abbreviated TOR, is a massively multiplayer online roleplaying game set in the Old Republic era, and is currently under development by BioWare, a division of Electronic Arts. The game was first officially announced in an October 30, 2007 press release, though details were vague. On October 21, 2008, the title of the game was revealed, in addition to a fair amount of detail about the game in a press conference. A novel, released around the same time as the game, will cover the story behind it. Yes they do. But cmon, is that really so bad for a MMO? If the graphics were very high quality the game would lagg like hell on older computers, not to mention that it would be unplayable to everyone that dosen't have a very fast internet. "Few creatures in the galaxy are as deadly as the legendary terentatek. these beasts cut imposing figures; their hulking frames are covered in an array of spikes, and each is armed with tusks and claws that deliver lethal venom. their prowess and hostility are well-known throughout the galaxy, but perhaps the creature’s most impressive quality is its hide, which is highly resistant to force attacks. this exceptional defense, combined with its raw power and violent nature, makes the terentatek formidable even to teams of the most skilled warriors."